The Earth Security Index 2016: Business Diplomacy for Sustainable Development provides a scenario for the top global resource risks facing the largest multinational companies in energy & infrastructure, extractives, and food & agriculture. The report analyses key growth markets for these industries and the political demands for social inclusion and sustainability that will drive their political agendas. 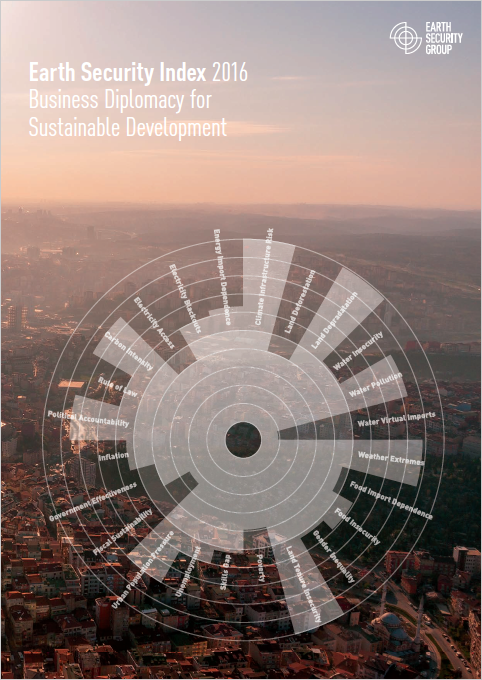 It identifies those critical issues where companies must strengthen their ‘business diplomacy’ for sustainable development, providing examples of the models and partnerships that are needed for companies to work with national governments to turn risks into opportunities for sustainable growth.